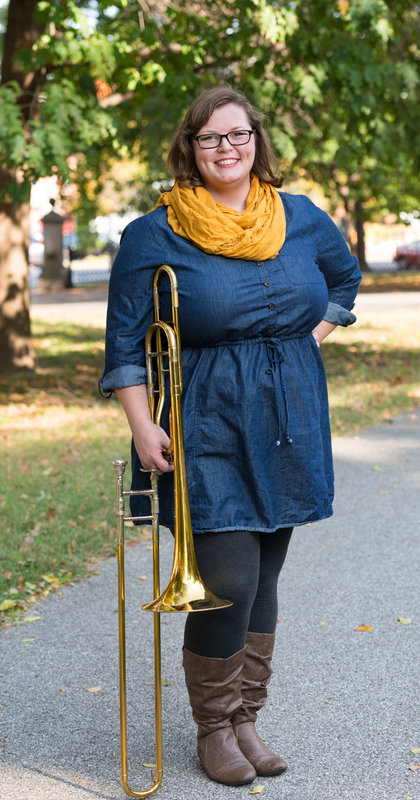 Born and raised in St. Louis, Missouri, Gabe Mueller began playing trombone when she was 10 years old. As the story goes, she had the option of signing up for either band or study hall, which was a no-brainer. On that fateful "try the instruments" day, she was handed a trombone, managed to play a low Bb, and, feeling no need to try any other instruments, decided the trombone was for her. Having fallen completely in love with performing her instrument, Gabe traveled down to Denton, Texas, in 2003 to study music at the University of North Texas, earning a Bachelor of Music in Trombone Performance and a Minor in Music Theory. She has been fortunate to study with several great teachers, including Jan Kagarice, Vern Kagarice, Tony Baker, Steve Lange, and Donny Pinson. While at UNT, Gabe performed in many university ensembles, including Symphonic Band, Chamber Orchestra, Jazz Lab Bands, the Green Brigade Marching Band, and trombone choirs and quartets. She also marched baritone for three seasons (2002-2004) with Southwind Drum and Bugle Corps. While in the North Texas area, Gabe was a freelance trombonist, performing with various ensembles including the Flower Mound Symphony Orchestra and Sherman Symphony Orchestra. Now living back in her hometown, Gabe is active in the St. Louis music scene, currently playing trombone with St. Louis funk band Hazard to Ya Booty. She has performed with many St. Louis ensembles, including the St. Louis Low Brass Collective, the Matt McCallie Jazz Orchestra, the University City Summer Band, and the St. Louis Wind Symphony, and has been heard in the pit orchestra for productions at Stray Dog Theatre, Gateway Center for Performing Arts, and Fr. William Scheid Players. She is also an active church musician, soloist, and chamber musician and is a founding member of Harmony Brass Quartet. To see what's up next on Gabe's plate, click here. 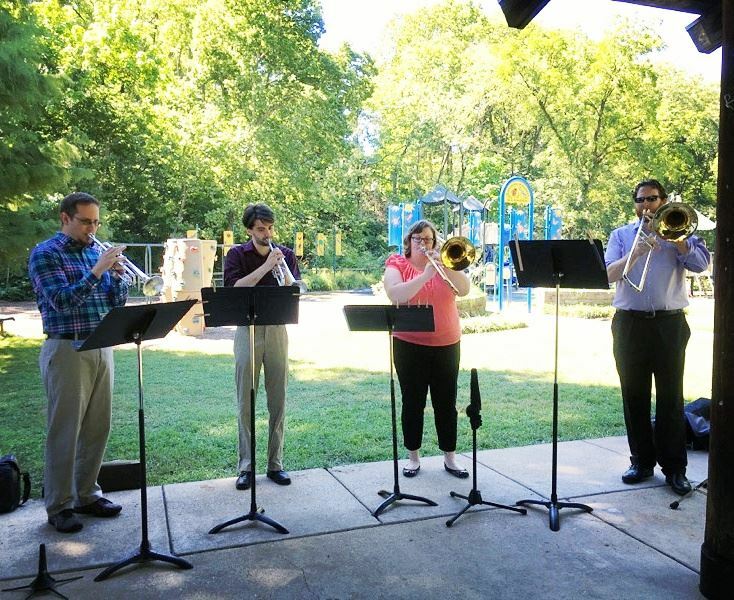 Gabe has a bustling private low brass studio with middle school and high school students in the Rockwood, Parkway, Lindbergh, Kirkwood, Webster Groves, Northwest, and Francis Howell school districts. She hosts a monthly studio class as an opportunity for her students to meet other fellow low brass students, have clinics with top low brass musicians, perform for their peers, and play in a low brass choir. Gabe's students have been members of the St. Louis Symphony Youth Orchestra, Missouri All State concert band, St. Louis Suburban and Metro 8 district honor bands, SIUE Bi-State honor band, and have received "1" ratings at district and state solo and ensemble festival. Gabe also works as a low brass clinician for local schools and is the Director of Marching for Northwest High School in Cedar Hill, MO. For more information about studying with Gabe, click here. Gabe has a deep passion for the non-profit world and has worked for a variety of performing arts organizations for over 10 years. She currently serves on the board of directors for the St. Louis Low Brass Collective. Click Here for audio and video recordings of Gabe in performance. Freelance trombonist and music instructor in Saint Louis, Missouri.